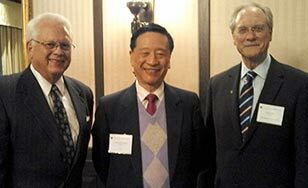 President Larry Goodwin, right, and Tom Homan, left, with United International College President Ng Ching-fai at an April 23 dinner in St. Paul hosted by the Minnesota Private College Council. The College's relationship with United International College in Zhuhai, China, now is also benefiting nine of our peer Minnesota Private College Council institutions. Since President Larry Goodwin initiated the partnership in 2003 we have exchanged faculty and students, and several St. Scholastica alumni have interned at UIC following graduation here. We have a J-term program there for our business majors, co-led by Rick Revoir and Tom Zelman. Tom also leads a month-long summer experience for UIC students on our campus every other year. The next will be in 2015. UIC is planning to build a second campus to open in 2015. Its president, Ng Ching-fai, has invited 10 partner colleges under the aegis of MPCC to join in the expansion of their arts and humanities programs. Meanwhile, St. Scholastica adjunct professor Arlene Anderson is on the faculty of UIC teaching business ethics. Lisa Larson co-leads a faculty-development institute which brings MPCC faculty together with UIC faculty to explore classroom teaching and learning approaches. She'll travel to UIC in July for that event. And alumni Benjamin Grams '06 and Joel Sundstrom '08 now teach at UIC and help nurture the relationship between the institutions.